The A Series solenoid valve gives you a highly adaptable design for practically all applications requiring flow between CV 0.019 and 0.300. 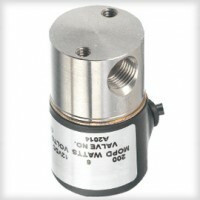 This robust 2- or 3-way miniature solenoid utilizes a stainless steel body to resist corrosion for most acids, alkaline solutions, and harsh environments. Also available in plastic — from polypropylene to Delrin®— when specific inert or demanding requirements are needed. Available in numerous port configurations, orifice sizes, and material combinations, the A series is a highly flexible valve that fulfills the requirements for most applications.